Creating customized solutions for smile restorations. Since she was a kid, Kit Kimbl wanted to work in the dental field. When she was old enough, the Detroit native attended the University of Michigan Dental School and became a dental hygienist. She then moved to Florida and practiced here for many years, until she retired a few years ago. Kit’s experience in the dental field greatly influenced her decision when finding a new dentist. Kit has always been a stickler about her teeth. When they began to show signs of wear and tear, she was distressed by their appearance and worried about her dental health. 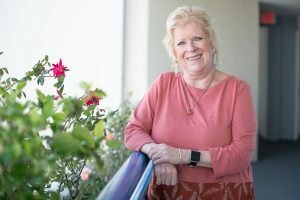 “One thing about dentists and dental hygienists, anybody who went to dental school actually, is we brush our teeth a lot, more than the typical person,” Kit relates. “Then as we age, we wear down our teeth. Because of the serious issues with her teeth, Kit anticipated a dramatic overhaul was needed to get them back in shape. She had no hesitation about which dentist she would trust with her smile, because she knew one well. That dentist is Stephen P. Lester, DDS, of Park Avenue Dentistry in Edgewater. 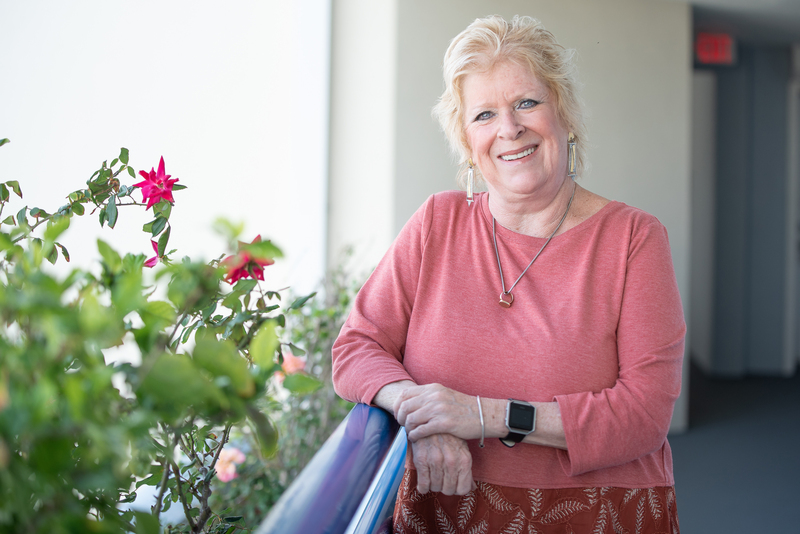 “I was married to a dentist, an orthodontist, and we met Dr. Lester in this community twenty-five years ago,” Kit shares. “Since we’re all in the dental field, my husband and I knew Dr. Lester personally, but also professionally. We know what a great dentist he is, so I’ve been going to him for years. Having been a dental hygienist, Kit also knew she needed an extensive smile restoration, so she visited Dr. Lester’s office to discuss the matter with him. “Kit has been a patient of mine since May 4, 2004,” Dr. Lester observes. “I made a note on that day that she was concerned about some staining and wear on her teeth. It took her fourteen years to pull the trigger and have her smile restored. That’s not unusual. Many people take years to get up the nerve to commit to a major dental restoration. It meant a lot to Dr. Lester that Kit chose him to do her smile restoration. After all, she was also in the dentistry field and knew all of the dentists in the area. She could have had her work done by anyone she wanted. Health care professionals aren’t always the best patients, however, and Kit found it difficult to be on the patient side of the dental chair. “I spent my entire career in periodontal surgery, so I’m used to more difficult and intense dental procedures,” Kit describes. “But I certainly don’t want that to be happening to me. I was trying to be a good patient, but I don’t like being a patient. I like being on the other side. 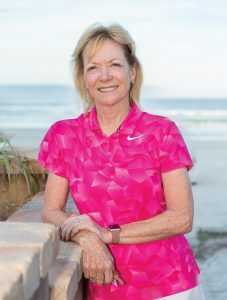 Native Floridian Robin Park is a retired REALTOR® who worked out of Tampa. She and her husband have had a home in New Smyrna Beach since 1996. In June 2018, they decided to move there full-time. As a permanent resident, Robin knew she had to establish herself as a patient with a new dentist. She chose Dr. Lester at Park Avenue Dentistry. “I interviewed three or four different dentists, but Dr. Lester impressed me the most,” Robin reveals. “He was so nice and such a good listener, which I appreciated. The other dentists I interviewed just didn’t have the communication skills he had. As the result of a childhood injury – Robin was hit in the mouth by a baseball bat when she was 12 – she had crowns on her front teeth for many years. Over time, however, those crowns began to look dingy and worn, and Robin was unhappy with their appearance. Initially, Robin asked Dr. Lester to place new crowns on six of her front teeth, which he did. Dr. Lester recommended she also crown the four teeth directly behind the six that she requested, but Robin said she was satisfied with what the dentist had done initially. That’s until her husband noticed her smile restoration was not complete. “After I had my six teeth crowned, my husband looked at me and said, Go back and get the four others crowned,” Robin recounts. “It’s funny, but sometimes when I smiled, he could see the uncrowned teeth behind the front teeth that were crowned, and they didn’t look as good. “People have much broader smiles than they think they do,” Dr. Lester explains. “They show more of their back teeth than they realize. When people look at themselves in the mirror, they generally see themselves straight on, so they only see the teeth in the front. “When they’re in a group and conversing, however, people are standing closer to their ears and see them at different angles. They can see eight or ten teeth; everybody is a little different. All of those teeth are in the smile line. That’s why I recommend crowning the teeth directly behind the front teeth. Dr. Lester’s thoroughness and attention to detail really impressed Robin. She says he worked hard to make sure her smile was perfect. Dr. Lester begins the smile restoration process with an extensive interview with his patients, whether they’re new patients or patients who have been with him for 20 years and have finally decided to take the plunge. “During the interview, the patients do most of the talking,” Dr. Lester notes. “I ask them certain key questions to guide them through and to get the information I need to proceed. While the patients talk, I try to ascertain what they want and what their expectations are. In addition to the models, Dr. Lester also takes photographs of the patient’s teeth before and during the restoration process. He sends the photographs to the technicians at the dental lab to help them visualize the patient’s teeth and make the crowns exactly to the desired specifications. Dr. Lester acknowledges. “It would take many hours to make multiple crowns in-house, and we don’t want to keep our patients in the dental chair that long. “We transfer all the information needed to make the crowns to the lab in text, photographs and simulated models. This is to help the lab technicians understand what the patient wants. If the patient’s expectations are unrealistic, the lab will let me know. Using Dr. Lester’s plaster models, patients can actually see the dentist’s solutions for their smile restorations. They can make adjustments, shaping the models to be sure the case is proceeding exactly how they want it. “At this point, we’ve got everything worked out ahead of time,” Dr. Lester expounds. “The patient has seen the restoration solution created in plaster. We’ve tweaked them according to the patient’s requests, and we’re all agreed that this is the way we want them. We now prepare the teeth to accept the crowns. This includes numbing the mouth, shaping the teeth and making molds. “Patients first get temporary crowns, which we hand-make in the office. The temporaries are made from molds of the models that the patient has adjusted and approved. They’re the exact size, shape and color that we’ve decided as a team is what the patient desires. Dr. Lester stresses that the smile restoration process is patient-driven. Patients are active participants throughout the entire process. Kit and Robin were involved with the creation of their new crowns, but they still got surprised. Both were surprised by just how good the crowns turned out. Robin has achieved the smile she wanted since she was a child. “My teeth look fabulous,” Kit raves. “I’m shocked by the finished product because the crowns look so much like my natural teeth, but way better than my natural teeth. When I look at myself and at photographs of me when I was twenty or thirty, my teeth look like they did back then. “All of the health professionals in this area are very discreet, but people not in dentistry come up to me and say, You look so great. What did you do? Did you change your hair? Did you lose weight? They can’t tell what I had done. Robin is very pleased with the results of her restoration as well. She’s grateful her husband and Dr. Lester recommended she have the teeth behind her front teeth crowned. She says thanks to Dr. Lester, she achieved the smile she hoped for all along. “My teeth are perfect,” Robin enthuses. “Dr. Lester did a great job. I wanted a full smile with white teeth, and that’s what I have now. My husband was there when Dr. Lester placed my finished crowns, and he agrees. Dr. Lester really wanted to make sure we were completely satisfied, and I am definitely satisfied. Both women are happy they chose Dr. Lester to do their smile restorations. Robin likes Dr. Lester’s kindness and calm demeanor as well as his talent, which made her experience at Park Avenue Dentistry excellent. She thinks others should take advantage of Dr. Lester’s professionalism and skill. Stephen P. Lester, DDS, MAGD, P.A.